For other people named John Stockton, see John Stockton (disambiguation). John Houston Stockton (born March 26, 1962) is an American former professional basketball player. He spent his entire professional playing career as a point guard for the Utah Jazz of the National Basketball Association (NBA), from 1984 to 2003. Stockton is regarded as one of the greatest point guards of all time, holding the NBA records for most career assists and steals by wide margins. He is a ten-time NBA All-Star, and a two-time Naismith Memorial Basketball Hall of Fame inductee (in 2009 for his individual career, and in 2010 as a member of the 1992 United States men's Olympic basketball team "Dream Team"). In 2015, Stockton became an assistant coach for the Montana State University women's basketball team. Stockton was born in Spokane, Washington, to Clementine Frei and Jack Stockton, Stockton's ancestry is Irish and Swiss German. He attended grade school at St. Aloysius and moved on to high school at Gonzaga Prep and graduated in 1980, after breaking the city record for points scored in a single basketball season. After considering offers from Don Monson at Idaho and Mike Montgomery at Montana, both in the Big Sky Conference, Stockton decided to stay in Spokane and play college basketball for Dan Fitzgerald at Gonzaga University. He became the third generation in his family at GU; grandfather Houston Stockton was a well-known football player for the Bulldogs in the 1920s. Fitzgerald was also the athletic director; he stepped away from coaching for four years after Stockton's freshman year and promoted assistant Jay Hillock to head coach. During his senior year for the Bulldogs in 1984, Stockton averaged 20.9 points per game, shooting 57% from the field. The Zags posted a 17–11 record, their best in 17 years, and Stockton led the West Coast Athletic Conference in scoring, assists, and steals. He was one of 74 college seniors invited to the spring tryouts for the 1984 U.S. Olympic team, coached by Bob Knight. Stockton made the initial cut in April to the final twenty, but was one of four released in May (with Charles Barkley, Terry Porter, and Maurice Martin) in the ultimate cut to 16 players. Though not selected, the experience led him to meet his future teammate and friend, Karl Malone. 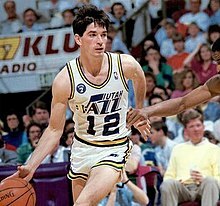 In June 1984, Stockton was selected by the Utah Jazz in the first round of the 1984 NBA draft with the 16th overall pick. A relative unknown during his college career, his stock rose significantly in the months before the draft. Nevertheless, the announcement of his selection to the thousands of Jazz fans gathered at the Salt Palace on draft day was met with a stunned silence. Stockton became the starting point guard for the Jazz in the 1986–87 season. In 1988–89, he played in his first All-Star Game, and led the NBA in assists per game for the first of nine consecutive seasons. In 1992, Stockton and the Jazz reached the Western Conference Finals for the first time, but were defeated by the Portland Trail Blazers in six games. Along with Malone, Stockton was named co-MVP of the All-Star Game in 1993; the game was held in Salt Lake City. Stockton and the Jazz reached the Conference Finals again in 1994 and 1996, but lost to the Houston Rockets and the Seattle SuperSonics, respectively. 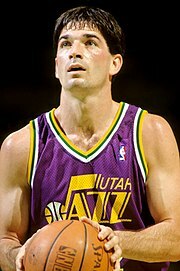 John Stockton spent his entire NBA career with the Utah Jazz, from 1984 to 2003. Utah set a franchise record and led the Western Conference with 64 wins in the 1996–97 season. The team again reached the Western Conference Finals. In Game Six of the Conference Finals, Stockton scored 25 points and made a buzzer-beating, game-winning three-point shot over the Houston Rockets' Charles Barkley to send the Jazz to the first of two consecutive NBA Finals appearances. Stockton's game-winner became known as "The Shot". The Jazz were defeated by the Michael Jordan-led Chicago Bulls in six games in the Finals. Stockton missed the first 18 games of the 1997–98 season with a knee injury, but the Jazz returned to the NBA Finals and again faced the Bulls. In Game 6 of the 1998 NBA Finals, Stockton made a three-pointer with 41.9 seconds left to give the Jazz a lead, but Bulls guard Michael Jordan made two field goals to put his team ahead 87–86. Stockton missed a three-point attempt with 5.2 seconds left and said in a post-game interview that he felt confident that the shot would go in. The Bulls again defeated the Jazz in six games. The Jazz made the NBA Playoffs every season during Stockton's 19-year NBA career. On May 2, 2003, Stockton announced his retirement with a released statement instead of the customary news conference. The Jazz later held a retirement ceremony for him, in which Salt Lake City renamed the street in front of the venue then known as Delta Center (now Vivint Smart Home Arena), where the Jazz play, John Stockton Drive. Stockton would later declare that despite being still content with the game and how well he was playing, his growing family made him feel that "sitting in the hotel room waiting for games wasn't making up for what I was missing at home." Stockton's number 12 jersey was retired by the Jazz during a game on November 22, 2004. A statue of Stockton can be seen in front of the Vivint Smart Home Arena; an accompanying statue of Karl Malone was placed nearby on March 23, 2006. The Malone and Stockton statues stand on a bronze plaque commemorating their achievements together. Stockton was inducted into the Naismith Memorial Basketball Hall of Fame in 2009. Stockton was also inducted into the Hall of Fame along with the rest of the 1992 United States men's Olympic basketball team in 2010. Stockton, along with other NBA stars, played on the basketball team in that year's Olympics in Barcelona, Spain. The 1992 team was the first U.S. Olympic squad to feature NBA players. The team became known as the Dream Team; the Naismith Memorial Basketball Hall of Fame called it "the greatest collection of basketball talent on the planet". Stockton also played on the 1996 U.S. men's Olympic basketball team. Stockton won gold medals with both the 1992 and 1996 teams. Stockton was known for his unassuming, no-nonsense approach to the game, hard-nosed defense, and fanatical work-ethic, which resulted in his unusual durability. He missed only 22 games in his 19-season career. In his first 13 seasons, he missed only four games (all in the 1989–90 season) until he missed the first 18 games of the 1997–98 season due to an injured MCL in his left knee sustained in the preseason. That was the only major injury in his career, and he never missed another game after returning from that injury. Stockton earned the "old school" tag for his physical play; surveys of athletes and fans alike often judged him among the toughest players in the NBA, usually just behind teammate Karl Malone. Stockton's tenacity also earned him a reputation among some in the league as being a dirty player, as evidenced by a poll Sports Illustrated conducted in 1997 where he was voted as the second dirtiest player in the league behind Dennis Rodman. His patented "short shorts" became known as "Stocktons"—since he continued to wear the style long after the rest of the league had adopted a baggier look. Stockton's career is also notable for its consistency and longevity. He remained a starting NBA player until his retirement at age 41. Stockton's Utah Jazz made the NBA playoffs in all 19 of his seasons in the league. Stockton avoided most endorsements and stayed loyal to Utah despite being offered more money by other teams. In 1996, he agreed to a deal that made salary-cap space available so the team could improve, but in exchange, he insisted on guaranteed Delta Center ice time for his son's hockey team. For many years, Karl Malone and Stockton were the Jazz's one-two punch. The two played a record 1,412 regular season games together as teammates. Many of Stockton's assists resulted from passes to Malone. Stockton and Malone have been described as the greatest pick-and-roll combination of all time. Stockton and Malone are also considered two of the best players who never won an NBA championship. Stockton holds a commanding lead for the NBA record for career assists with 15,806. Stockton also holds the record for assists-per-game average over one season (14.5 in 1990) and is one of three players who have logged more than 1,000 assists in one season, joining Kevin Porter (1,099 in 1979) and Isiah Thomas (1,123 in 1985) in the exclusive list. Stockton did this seven times, with season totals of 1,164, 1,134, 1,128, 1,126, 1,118, 1,031 and 1,011 assists. On defense, Stockton holds the NBA record for career steals with 3,265. In second place is Jason Kidd, with 2,684. Stockton was also a capable scorer (13.1 points per game career average and a 51.5 career shooting percentage) with a reliable three-point shot (38.4% lifetime average). As of April 2019, he is 49th on the all-time NBA scoring list with 19,711 career points. Stockton was selected to the All-NBA First Team twice, the All-NBA Second Team six times, the All-NBA Third Team three times, and the NBA All-Defensive Second Team five times. He was selected to 10 All-Star Games. He was named one of the 50 Greatest Players in NBA history in 1996. On May 11, 2006, ESPN.com named Stockton the fourth best point guard of all time. Hust Stockton, Stockton's grandfather (also named John Houston Stockton) played professional football for the nascent National Football League, for the Frankford Yellow Jackets in the 1920s, including the Yellow Jackets' 1926 NFL Championship team. Stockton and his wife, the former Nada Stepovich (of Serbian ancestry and the daughter of Matilda and Mike Stepovich, the last territorial governor of Alaska), reside in Spokane, Washington, and have two daughters, Lindsay and Laura, and four sons, Houston, Michael, David and Samuel. Houston Stockton played college football as a defensive back for the University of Montana Grizzlies. In 2011, Michael Stockton, who played basketball at Salt Lake City's Westminster College, signed with BG Karlsruhe in Germany's second basketball division. In 2017, Michael signed with BG Göttingen in Germany's first basketball division, the Basketball Bundesliga. David Stockton completed his college basketball career at Gonzaga in 2014 and after playing for the Reno Bighorns in the NBA's Development League played for the NBA's Sacramento Kings and Utah Jazz. He currently plays for Medi Bayreuth. Daughter Lindsay Stockton graduated from Montana State University and daughter Laura Stockton currently plays at Gonzaga. Stockton has a brother and three nephews who have played college basketball. Steve Stockton, his brother, played for the University of Washington; his oldest son, Steve Stockton Jr., formerly played at Whitworth College; and another son, Shawn Stockton, finished his college basketball career at the University of Montana in the 2011–12 season. Steve's youngest son, Riley, played for Seattle Pacific. Stockton and his family are devout Roman Catholics. Following his retirement, Stockton started coaching in youth teams, being "an assistant on seven or eight teams at once" in 2003. The Jazz also invited Stockton to train both Deron Williams and Trey Burke. Stockton also became involved in various businesses. In 2013, Stockton released his autobiography Assisted, written with the assistance of his junior high school coach Kerry L. Pickett. Karl Malone wrote the foreword. Stockton was on the Jazz's long list of coaching candidates to replace Tyrone Corbin, before the selection of Quin Snyder. On October 27, 2015, Stockton joined Montana State University's women's basketball program as an assistant coach to replace Kellee Barney. Barney left the program to pursue a career in business, and Stockton had previously coached four of the players on the MSU women's team during Amateur Athletic Union leagues. ^ "NBA All-Time Assists Leaders – National Basketball Association – ESPN". Espn.go.com. Retrieved September 10, 2016. ^ "NBA All-Time Steals Leaders – National Basketball Association – ESPN". Espn.go.com. Retrieved September 10, 2016. ^ "1". Freepages.genealogy.rootsweb.com. Retrieved September 10, 2016. ^ Rushin, Steve (July 27, 1992). "City of stars". Sports Illustrated. p. 62. ^ Weaver, Dan (September 17, 1990). "Stockton: one of NBA's premier point guards sweated his way to superstar status". Spokesman-Review. p. C1. ^ Goodwin, Dale (February 22, 1980). "Stockton: Slow to grow, quick to score". Spokesman-Review. p. 22. ^ a b Goodwin, Dale (April 7, 1980). "Stockton to enroll at Gonzaga". Spokesman-Review. p. 23. ^ "Hillock gets Gonzaga job". Spokane Daily Chronicle. March 4, 1981. p. 21. ^ Blackwell, Dave (June 20, 1984). "Stockton pick hailed as Jazz coup". Deseret News. p. G-1. ^ Blanchette, John (April 24, 1984). "Stockton makes Olympic cut". Spokesman-Review. p. C1. ^ Weaver, Dan (April 30, 1984). "What's the going price of gold?". Spokane Chronicle. p. 11. ^ Blanchette, John (May 14, 1984). "Basketball school is over for Stockton". Spokesman-Review. p. 13. ^ a b c d "John Stockton on Jordan, Malone and post-NBA life". CNN. November 11, 2013. Archived from the original on November 11, 2013. ^ a b Blackwell, Dave (June 19, 1984). "Jazz surprise by taking Stockton". Deseret News. p. D-1. ^ Hamilton, Linda (June 20, 1984). "The more you see him, the more you like him". Deseret News. p. G-6. ^ a b c d e f g "Legends profile: John Stockton". NBA.com. Retrieved April 5, 2019. ^ Sorensen, Mike (May 28, 2017). "How John Stockton's shot became 'The Shot'". DeseretNews.com. Retrieved April 5, 2019. ^ Hamilton, Linda (June 15, 1998). "Stockton thought last shot was in". Deseret News. p. 1. Retrieved July 9, 2011. ^ Buckley, Tim (June 8, 2003). "The Long Goodbye". Salt Lake City: Deseret News. Archived from the original (Reprint) on January 4, 2009. Retrieved August 20, 2008. ^ Genessy, Jody (September 9, 2009). "Utah Jazz: Stockton chooses Isiah, Sloan picks Barkley as HOF presenters". Deseret News. Retrieved May 3, 2012. ^ a b Genessy, Jody (August 14, 2010). "Utah Jazz: For Karl Malone, John Stockton, Dream Team erased memories". Deseret News. Retrieved July 6, 2011. ^ Sheridan, Chris (August 13, 2010). "Charles Barkley relives Dream Team". ESPN.com. Retrieved April 5, 2019. ^ "John Stockton Signs New Contract With Jazz". AP News. October 3, 1996. Retrieved April 5, 2019. ^ a b c Byington, Rich (November 16, 2011). "10 Greatest Moments of John Stockton's Career with the Utah Jazz". Bleacher Report. Retrieved April 5, 2019. ^ "The Dirtiest Player?". CNN. April 14, 1997. ^ Gardner, Charles F. (September 28, 2016). "Notes: Stockton gives Kidd an assist in Bucks training camp". Milwaukee Journal Sentinel. Retrieved April 5, 2019. ^ "ESPN.com: NBA – Stockton let his game speak for him". Static.espn.go.com. Retrieved September 10, 2016. ^ Genessy, Jody (October 16, 2017). "Stockton and Malone – and their flip phones – together again". DeseretNews.com. Retrieved April 5, 2019. ^ McEntegart, Pete (January 19, 2007). "Best Players to Never Win a Championship" (Electronic). online: ESPN.com. Retrieved February 14, 2009. ^ Exner, Rich (February 7, 2017). "Where LeBron James ranks all-time in the NBA for assists; how high he could go". cleveland.com. Retrieved April 5, 2019. ^ "NBA Basketball Statistics, Draft, Awards, and History". DatabaseBasketball.com. Archived from the original on October 14, 2016. Retrieved September 10, 2016. ^ "NBA & ABA Career Leaders and Records for Steals". Basketball-Reference.com. January 1, 1970. Retrieved September 10, 2016. ^ "NBA & ABA Career Leaders and Records for Points". Basketball-Reference.com. Retrieved April 5, 2019. ^ "Who Has Made The Most NBA All-Star Game Appearances of All-Time". FOX Sports. February 15, 2019. Retrieved April 5, 2019. ^ "ESPN.com – NBA – DAILY DIME: SPECIAL EDITION 10 greatest point guards ever". Sports.espn.go.com. May 11, 2006. Retrieved September 10, 2016. ^ McCallum, Jack (April 25, 1988). "Not a passing fancy". Sports Illustrated: 72. ^ "Philly.com: Health and Medical News". www.philly.com. Retrieved December 8, 2017. ^ a b c d e "John Stockton's nephew agrees to play basketball for Griz". Retrieved April 8, 2018. ^ The Utah Jazz Will Host The Most Utah Jazz NBA Draft Workout Ever On Tuesday - Ridiculous Upside — "The most interesting player to show up at the workout will be Stockton, simply based on name recognition alone after playing the last four seasons for the NAIA's Westminster Griffins"
^ "Michael Stockton signs pro contract with German team". Deseret News. July 21, 2011. Retrieved September 10, 2016. ^ "Shawn Stockton Stats, Bio – ESPN". Espn.go.com. December 12, 1989. Retrieved September 10, 2016. ^ "Seattle Pacific University Athletics – SPU's Stockton is GNAC Player of the Week". Spufalcons.com. Retrieved September 10, 2016. ^ Josh Furlong (November 15, 2013). "John Stockton embarks on autobiography book tour". KSL.com. Retrieved September 10, 2016. ^ Genessy, Jody (May 30, 2013). "Utah Jazz: John Stockton autobiography 'Assisted' to hit shelves this fall". Deseret News. ^ Stein, Marc (May 14, 2014). "Jazz to gauge John Stockton interest". ESPN. Retrieved September 6, 2016. ^ a b Schulz, Tom. "NBA Hall of Famer John Stockton Joins Montana State Women's Basketball Staff". MSUbobcats.com. Montana State University. Archived from the original on October 28, 2015. Retrieved October 27, 2015. ^ Urquhart, Jack (March 18, 2016). "Worlds almost collide for John Stockton and his daughters". DeseretNews.com. Retrieved April 5, 2019. ^ "John Stockton to assist daughter, others at Montana State". ESPN.com. October 27, 2015. Retrieved April 5, 2019. Wikimedia Commons has media related to John Stockton.